That title is a reference to what you might have heard as a medieval way of thinking – The great chain of being. Really it goes back to the Greeks and Romans and the ancient world. You might also have heard it referred to as the order of creation which I take as the Christian attempt to baptize the chain of being. There is a truth buried within it. God is sovereign. But natural man can’t understand that correctly. We think chain of being or order of creation and immediate jump to hierarchical org charts. 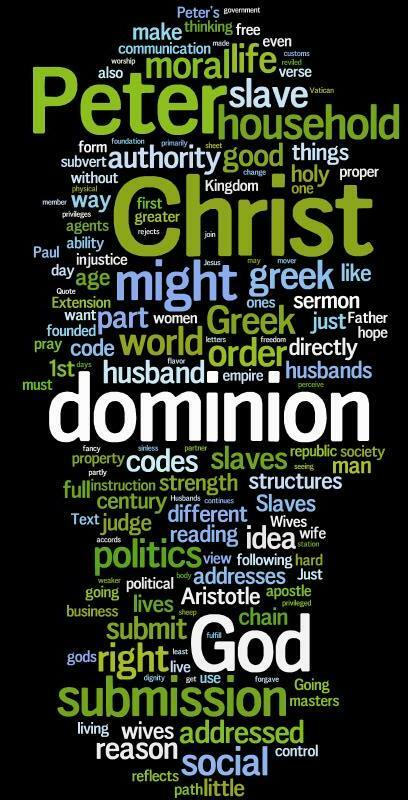 We think dominion. Roman philosopher Seneca held we couldn’t make progress until “we conceived the right idea of god.” The right idea of God put forward by Peter is Jesus – the suffering servant. The one who submitted himself to our bad justice. I preach within a denomination that holds to what the larger Christian world calls complementarian sexual roles. They hold this view largely on the basis of an order of creation. Here is the page with the various studies that have been done by the LCMS. The most recent one being the Creator’s Tapestry in 2009. Bluntly, any order of creation argument is missing the point. To derive dominion for the husband out of 1 Peter requires completely misreading and selectively quoting. (The CTCR report doesn’t look at the entire passage, nor does it put it in historical frame, it just quotes the wife/husband part.) The entire passage is a household code. That form is not an OT form but a Greek form. In the sermon I’ve quoted what some of those greek codes said from names like Aristotle, Plato and Seneca. Peter uses the form, but completely subverts it. He starts with slaves. Slaves who didn’t have any moral ability in those greek codes. Slaves would never have been addressed by a greek writer. In Christ the slave comes first because he/she is the closest model to Christ. Only then does Peter move on wives and husbands. The teaching is live holy lives of mutual submission reflecting Christ. Find that the other has more value than yourself. Uphold the society you live in where possible, Christian freedom is not to tear down society, but know that your dignity comes from God having chosen you. You are not chained in being or orders of creation instead you willfully submit to Christ, who submitted himself to the cross. Any theology or politics of dominion must meet its end at the cross.